...for me and Larry Potterfield! Today was more of a grind than I expected,, but I did get to meet a lot of great people (and even got several excellent ideas to steal!). I hope to get out on the floor a little bit more tomorrow. couple of things that did catch my eye..the (full-sized) Rossi lever gun, the Rio Grande, a Marlin clone, is not available in .410 and in...wait for it...45/70. The 45/70 is just a spectacular lever gun cartridge, and with Marlins in short supply (and expensive) and 45/70 Winchesters darned expensive, I think a lower-priced alternative ($540-ish MSRP) will be very welcome. Although it has been overshadowed by Ruger's bigger introductions (including a "budget-priced version of the successful piston gun, the SR556, at $1369 MSRP), the new Ruger-branded 25 rund 10/22 magazines will be very welcomed by the hordes of .22 shooters out there. I stopped by CMMG and was amazed at the number of .22 conversions units for the AR that have blown out the doors...it's a huge number, and CMMG is aggressively pushing their new dedicated .22 ARs at a $500 price point. I may have to add one of the CMMG guns to my AR "library." I briefly stopped by Para to look at their .45 higher capacity 1911 package aimed at competitors. The package comes with 5 magazines, fiber optic front and a railed frame in the $1500 region. They've also added a lightweight Commander-sized .45 to their line once again. I'm going to get some pictures tomorrow from Black Rain, who make 'way cool ARs...nothing says rock and roll like skull anodizing! Seriously, it's the next step...ARs as fashion statements! 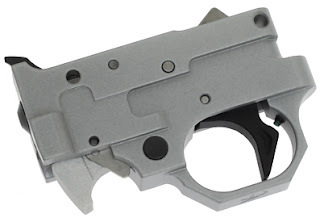 Interestingly enough, I think Rail Fever has run its course...Stag kicked it off at SHOT, and now CMMG, Ruger and numerous other makers are offering forearms without quad rails...rather, a fixed rail at 12 o'clock and screwholes to allow the user to attach rails as need...now doesn't that make hugh amounts of sense? Of course, I'll ALWAYS opt to attach my coffeemaker and aquarium bubbler...that's tactical! I'm about to contradict myself on the expensive Winchester question, but today was the first time I had a chance to handle the new Winchester 94 30-30s. They are sweet...sweeter than I expected. almost as sweet as my pre-'64 30-30 you'll be seeing in GUN STORIES. Pretty impressive job from Winchester...as smooth an action as I've felt on a 94. I'll be signing photos at the OC booth at 3PM tomorrow, plus I'm doing a presentation with Dave Spaulding on the Ruger/Gunsite Scout Rifle at 10:30AM at the Ruger booth. BTW, I did a smokin' interview with Brother Ted Nugent this afternoon for DRTV...you guys are going to LOVE this one...Ted unleased! Machine guns, helicopters, hogs...it's got it all. Have a big interview with Wayne LaPierre Sunday...I want to ask him about his asking Eric Holder, the least distinguished man to ever hold the position of Attorney General, to step down. Once more, into the storm! Looking forward to seeing everyone over the next few days..please, if you're at the NRA Show, stop me and say HI! Just look for a black cowboy shirt with skulls...something tasteful! We published this video yesterday on Facebook, YouTube and Down Range TV. It gives you an idea of what's comin'. Trying to get about 10 things done before Pittsburgh (today is script-writing day for next week's Hollywood adventure), so blogging has been at a minimum. I have to admit that I occasionally look at that gun and mumble, "Hamilton Bowen..." After all, how many thousands of dollars could it cost? Hint...more than I presently have! LOL! Here are some thoughts to share with your personnel when they have to contact citizens who may be carrying concealed. • People who have gone through the process of getting a concealed carry permit are, in general, law abiding citizens, not felons. Definitely read the whole thing, and if you carry concealed or open, spend some time thinking about how you need to interface with the local LEOs. 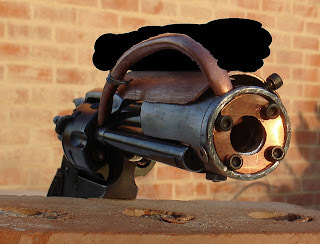 I took a lot of heat after SHOT for saying that the Taurus Raging Judge 28-gauge revolver and absolutely wonderful Rossi .410 mare's leg style pistol would not go into production. It's NRA Show time, and neither the Taurus nor the Rossi are going to go into production. Anyhow, I will be in Pittsburgh (not Pittsburg) for the NRA Show this weekend, and I would LOVE to meet as many of you as I can. I will be doing a signing at OUTDOOR CHANNEL'S booth at 3PM on Saturday. Hopefully, I'll be at the TACTICAL SOLUTIONS booth on Sunday and Andy Langlois' ANDY'S LEATHER booth on Friday. When we have times, we'll oust them here on the blog and on DRTV. I'll also be walking the Show floor, so I'm looking forward to meeting a lot of you guys! I think I'm definitely going to shoot the RRC World Championships in New Mexico in August...I have to say the wine is better in Morro Bay, but I shot that one last year. Hopefully I'm going to be able to shoot a couple of rimfire Steel Challenge matches as well (and, no, I will not shoot as well as Mr. Completely). 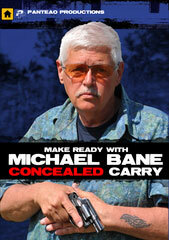 I've got a call in to my friend Ken Jorgensen and Ruger to talk about what pistol he's using for RRC. I shot my Ruger/TacSol 22/45 last year and it shot very well. Still, it's a little light IMHO...on a light gun I don;t tend to "settled" as quickly, and with an ultralight gun I tend to overrun targets...39/40 ounces seems to work well for me. I think the 22/44 with the Pac-Lite top end is in the 30 ounce range, maybe a little less. BTW, check out the podcast this week...I kinda like it. ...with Her teeth. Been snowing hard up here at the Secret Hidden Bunker all day, so the planned range trip with the Solo and the mountain bike ride went by the wayside. Instead I spent the afternoon overhauling my Ruger Rimfire Challenge rifle, a Target 10/22 with the hammer-forged barrel. I replied the trigger group with the wonderful Volquartsen TG2000 trigger group, a 2-pin solution to a perfect trigger. The group also includes an extended magazine release -- critical if you want to race a 10/22 -- and a bolt release that doesn't require 2 friends and a monkey to drop the bolt. I also added a Volquartsen polymer bolt stop (so the bolt's not stopping against a piece of steel, an extended bolt handle and recoil rod, and a stainless V-block (that holds the barrel in place). I really like the rifle, but I did want to clean up a few of its shortcomings. I shot it last year in the RRC World Championships (in New Mexico in 2011) fitted with my ancient Tasco Pro-Point red dot (hey, it's sighted in, even if the scope mounts are pretty much stripped). An Aimpoint Micro my be in my 10/22 Target's future, to be sure. I'm thinking about the RRC because...wait for it...wait for it...we might be running a state championship here in Colorado. I've been asked to serve as Match Director for an RRC, which if this comes off will be filmed for the new SHOOTING GALLERY...whoops! New SG? Did I say that out loud? Maybe an announcement next week! RRC-wise, we're looking at a September 10 match date at the Colorado Rifle Club, if it can be arranged with all the appropriate clubs. That's a Saturday, and on Friday we'll also be hosting an RRC workshop open to everyone. More as it develops, but we might be giving away a trip to this match on DRTV...stay tuned. Of course my poor Sweetie is being drafted as an assistant match director...since she's never run a match, she doesn't know how much pain is headed her way! She also hinted that a 10/22 made to her specs might be the payment for her work...paging Tactical Solutions! She already ransacked the gun safe and claimed the Tactical Solutions 1911 .22 conversion as her own. A Day That Wasn't Supposed to be Busy But is Anyway! Some days I so need a clone! Anyhow, I wanted to link up to an excellent article on the defensive use of lever action rifles from Uri Gebhard, who teaches for Gabe Suarez. We've been hammering on the lever gun as a viable defensive alternative for some time...as you know my regular defensive rifle is a Marlin 1894 .44 Magnum...powerful, accurate and easy to shoot. Here's a funny one from no less than Al Jazeera, reporting on the school shooting in Brazil — a country with draconian gun laws. The ace Al Jazeera reporter, noting that the NRA had been active in Brazil's recent progun vote, called the NRA offices to, "see if they had any thoughts about gun control in Brazil in light of the shooting in Rio." It's a huge secret rumor and you didn't hear it from me, okay? Is a major handgun company on the block, and is an even bigger conglomerate in hot and heavy negotiations to buy it? Only the cherubs and seraphim (welcome back, guys!) know for sure. BTW, DRTV clocked the biggest days in our history Monday & Tuesday! Thanks, all! Next week, an in-depth look at the Kimber Solo if I don't get snowed out at the range. Sebastian over at Snowflakes in Hell notes that with Obama's hand-picked choice Rep. Debbie Wasserman Schultz taking over as head of the Democratic National Committee, we're likely in for a rocky ride. Schultz is an antigun zealot heading up a now totally leftist Democratic Party, and I agree with Sebastian. The Blue Dog Dems are history, washed away in last November's elections. Schultz' pet project is eliminating all private sales of firearms...forget the so-called "gun show loophole'" no private sales at all. Some reports are saying that bills to eliminate private sales will be introduced in both the Senate and the House quickly by the usual shills. I have a gut feeling this a a major offinsive on the part of the Dems and BHo, the first real legislative assault on RKBA in a while, and we need to be prepared to go to war over it. The Dems got no traction on their various magazine bans and they're likely to abandon them to focus on private sales. As Sebastian noted, traditional Republicans don't particularly like their crazy uncles in the closet (that would be us) and certainly have no strong feelings about the Second Amendment and RKBA issues...they support us because in many elections we are the necessary swing votes. The GOP has been more attentive than usual because in the 2008 elections the Dems somewhat wisely recruited conservative candidates from conservative areas, which meant that the gun vote was not only split but that some of the Blue Dogs actually did believe in the Second Amendment (we certainly saw that in some areas of Colorado). Luckily, the Tea Party is pretty much 100% on RKBA, and I think they've shown they're unlikely to cave in the name BS "bipartisanship." Bipartisanship always reminds me of the old joke about a bowl of ice cream and a bowl of dog crap...mix them together and you have not a yummy acceptable compromise, but in fact 2 bowls of dog crap. BTW, I meant to get to this earlier, but it is important that you all read this great story over on the Red State Blog from last week, "Banning Guns By Changing Definitions:"
The article talks about something we've been watching very closely, ATF's tinkering with the nonsensical "sporting purposes" clause. I suspect this may be back-burnered by the now-flailing scandal-ridden ATF hierarchy (hey, it takes a lot of effort to decide who to throw under a bus! ), but you can expect it to come roaring back as soon as the scapegoats have been executed. 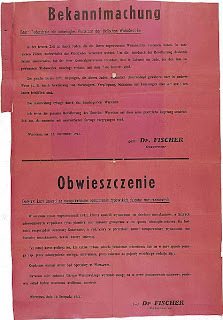 ...for the anniversary of the Warsaw Ghetto Uprising. 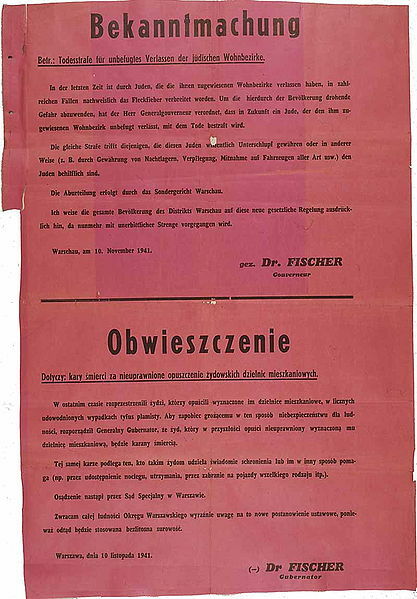 The poster above is a death penalty for all Jews caught outside the Warsaw Ghetto and for any Poles caught helping the Jews. As many as 13,000 Jews died in the uprising, but most of the remaining 50,000 Jews in the Warsaw Ghetto went to the gas chambers of Treblinka. We mourn the deaths, but celebrate the undeniable fact that for one magnificent month a poorly organized, largely unarmed band of freedom fighters defied the massive Nazi war machine and, above all, remember. So the Ruger SR1911 is officially out of the bag...for our full report, go to DRTV, where we've got huge video coverage. Marshal Halloway tells me that despite our non-insubstantial server capacity we're struggling with unprecedented traffic! Shot in Ft. Collins this AM (yes, as soon as I get home from the range, I go to the range...LOL!). I had a really good match, even though I could have laid down and gone to sleep on any of the stages. I finished 16th out of 106 shooters, my third high club finish in a row. I was out a bit on the ragged edge today, with 3 misses...my first misses in a while...but I needed to find that edge. BTW, my Sweetie was only 3 places behind me, coming in high woman. We'll be instructing a newbie cowboy class tomorrow, which will be fun. Later this week I'll be working more with the Kimber Solo, the Taurus Slim and more with the Ruger LC9. I suspect my parrots would be jealous of anything perching on my shoulder...even a camera. We were filming our special rifle class for TBD/SURVIVAL, working through one of the long field courses with targets from 100-200 yards or so. 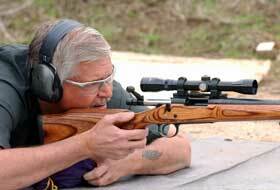 We built the class around the Ruger/Gunsite Scout Rifle,, which I absolutely love. We worked a lot on snap shooting, shooting on moving targets, position shooting from 7 yards to 300 yards, quick reloads, etc. We were shooting Hornady 165-gr SuperPerformance ammo, which basically yields 2600 fps out of the Scout's 16 1/2-inch barrel. I've said this before -- I love this rifle. It is everything I have wanted in a light, easy handling package with a powerful cartridge. I was shooting a Burris 2.75 scout scope, although I did really like Gary Paul Johnson's 1.5-4 Leupold scout scope. I didn't have any trouble making the 300 yard shots against pepper poppers with the Burris, but I think I might have been a little quicker on the trigger with a 4X. Anyway, you'll be seeing this starting the first week of July. REGARDING THE KIMBER SOLO -- damn, that little thing shoots good! My biggest worry for the little 9mm -- recoil -- turned out to be a non-issue. I mean, it pops you more than a .380, but it's no trouble to run the gun. We'll have a video report on DRTV, and I'll have my comprehensive review on Downn Range Radio next week. Couple of small issues -- the mag release button requires a *decisive* push to pop out the little magazines (which pretty much insisted on 5, rather than 6, rounds) and I would have liked a pinky hook on the mag base. This week I've been carrying a Ruger LC9 9mm in a Wilderness Tactical SafePacker...I just out the SafePacker on my belt and used it as my carry holster. No problemo...like not carrying a gun at all. BTW, I got to put some more rounds out of that gun that hasn't been announced...nice gun. Should such a gun ever materialize, we will have a massive video report on DRTV. Or something of the sort...I note I'm already being accused of whoring for a gun that hasn't yet been released and about which I've said nothing. Well, there you are! I thought, however, it might be a good time to re-mention Michael's Universal Law of 1911s, to wit, when evaluating 1911s there tends to be an equivalency of quality across price levels. A $1000 1911 is pretty much the same across the various brands. Brand A might throw in a little benny here or there, but they have to take away something else to make the gun come in at a specific MSRP. That said, in general the quality of 1911s right now tends to be across-the-board excellent, especially on the low end. 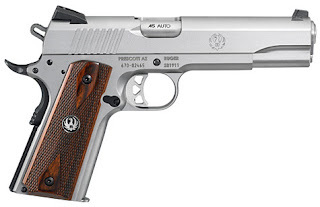 I've written about the Remington R1, the Taurus PT1911, the Para GI Expert, the lowest of the low-priced Rock Island Armory, the STI Spartan and am passingly familiar with the Springfield Mil-Spec (I've had them before; the only one I have now is the base gun of a Heinie Custom). All of these guns are on the lower end of the price scale for 1911s, and I would have killed for any one of these guns back in 1978, when we were doing build-it-yourself kits with non-functional Colts. There are indeed things I don't like about each one of those guns, but consider the price. I just got the Taurus back from Cylinder & Slide, where Bill Laughridge wanted to do a comprehensive hardness testing of the various parts (all good except for the MIM parts). Bill did some work on the Taurus to my spec, essentially fitting a new drop-in barrel and bushing, replacing the fire control system, and replacing the MIm safety and a couple of other MIM parts. The Taurus is now an excellent, not-hugely-expensive gun, semicustom gun (which is not a bad way to go with 1911s...start on an inexpensive commodity gun and build to your spec without going completely Brownell's catalog crazy). I don't have huge feelings about which is best for frames and slides, forged, cast or CNC-machined from bar stock. If done correctly, all produce quality guns. I don't even have it in for MIM (metal injection molding) parts...I just don't think MIM is the appropriate technology for certain applications such as the thumb safety. I have seen lots of MIM'ed thumb safeties break. You want to MIM the mag release or even the hammer, cool. On the higher dollar Colt Rail Gun I bought recently and left with Cory Trapp at the Gunsite Gunsmithy, all I said was clean up the trigger, fit Novak sights, ditch the ambi safety and the full-length guide rod and knock the sharp edges off it...not very much, and nothing that I couldn't absolutely live without. I do think major companies have something of an advantage over smaller houses because with modern equipment they can make most,if not all, of their own small parts, which gives them direct control over the quality of those parts. When you sources parts, it is sometimes a crap shoot (I have seen this over and over again in the Real World). The biggest issue I have on 1911s are people who insist on comparing apples to Chevy Volts...you've all read it, "I don't care what you say! My $4500 Nighthawk is better than a $389 Rock Island Armory!" Well, duh! My deep thought for the day: In the future, when some group wants to burn some politically or religiously objectionable book, will physical books be so rare that they'll have to get the books specially printed just to burn them? ...and am already at a dead run. I did some tinkering with my spam filter this morning in the hopes of eliminating a lot of that crappy fashion spam in the comments I've been fighting...I guess we'll see how the new parameters work (or whether they work). In gun stuff, how a bout a real steampunk revolver, an automatic ejecting Ruger single action .357? Here's the YouTube link and the comments from the creator of this eclectic masterpiece, Jim March, over at The Firing Line forums (the pix is courtesy The Firing Line/Jim March). All Jim needs now is to hook up with some of those new nerdboy/nerdgirl makers with their home C-N-C machines and a bunch of bright shiny brass, and no zeppelin in America will be safe. There is buzz all over the Internet about the inadvertently leaked Shooting Times Ruger 1911 cover (this from The Firearm Blog, who leaked it first)...wait...what Ruger 1911? Won't hear a word from me! OTOH, you might want to be checking in with DRTV next week. But you do that anyway, right? I strongly urge you to visit the Sipsey Street Irregulars blog and bring yourself up to speed on the ATF "Gunwalker" scandal, which is rapidly heading into the stratosphere and is about to explode. ATF is apparently in full panic mode after Phoenix Assistant Agent-In-Charge George Gillett — apparently the day-to-day guy for operation "Fast and Furious," the Jolly Pirate Club name for the ATF gunrunning business — rolled last week and agreed through his attorney to come clean to Congress on the scandal. This after Gillett failed to be invited to a giant ATF conclave of Agents-In-Charge last weekend to discuss the burgeoning disaster, apparently leading Gillett to believe he was first in line to be tossed under the bus. There are more revelations coming, to be sure. One thing to watch for is the White House using the current ATF scandal to create the next ATF scandal by shoving Chicago thug Andrew Traver down Congress' throat as the new head of ATF. Traver's career is rife with conflict of interests — working with International Association of Chiefs of Police and the Joyce Foundation promoting antigun causes — and overtly lying to the media on the difference between a "semiauto" and a "machinegun." Here's a comprehensive piece on Traver from No Lawyers Only Guns & Money. We have to be prepared for an all-out political effort to block Traver if the Obama administration tries to get him through as a "reformer." ...I think I'm going to get up tomorrow AM and go shoot a cowboy match down in Boulder...heck, I've been on the range all week, so why not go to the range? Gonna take my '66 .44 Russian out and see how it runs. I did get a chance to spend a little time with my friend Sandy Froman, former NRA President, Class III dealer and the only person I know with a cannon in her front yard. She had a smoking' hot short-barreled Saiga 12-gauge that, sadly, I did not get to shoot. We're going to try and spend some time at the NRA convention later this month...I need to do a sit-down with the NRA brass in Pittsburg and do a major download. I did get to reacquaint myself with a 7.62 Krinkov...nasty little beast that it is...courtesy of Cory Trapp, resident gunsmith at the GUNSITE Gunsmithy and full-auto instructor. I much prefer the 5.45 Krink, but the 7.62 flavor is controllable...just. BTW, I left that Colt Rail Gun I bought a while back with Cory to dink a bit — trigger work, Novak sights, excise the ambi safety and full-length guide rod, this and that. Don't want to give a lot away before Gun Stories premieres, but I am more convinced than ever of the efficacy of this round! Yes, I disabled the grip safety on the 1911 (a Wilson Master Grade that started as an Accu-Comp in the 1980s and was rebuilt to a 5-inch gun in the late 1990s) with a piece of bicycle tubing. As I've said repeatedly on SHOOTING GALLERY, I have girly-man hands, especially in the web area between the thumb and forefinger. 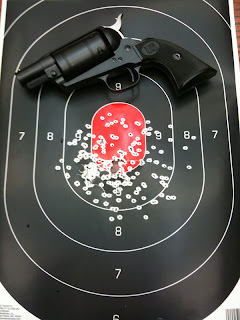 Shooting a high-thumb grip, sometimes I fail to depress the grip safety, even with "bump" style grip safeties. I've approached this in different ways over the years...some of my 1911s have super-light grip safeties, that is, if you hold the gun muzzle down the grip safety will disengage with its own weight. Back in the 1980s I (along with many many people, especially competitors) "pinned" the grip safety to keep it permanently engaged. It depends on the gun. The absolute best solution, IMHO, is Wayne Novak's "Answer" integrated mainspring housing/grip safety, which totally solves the problem. 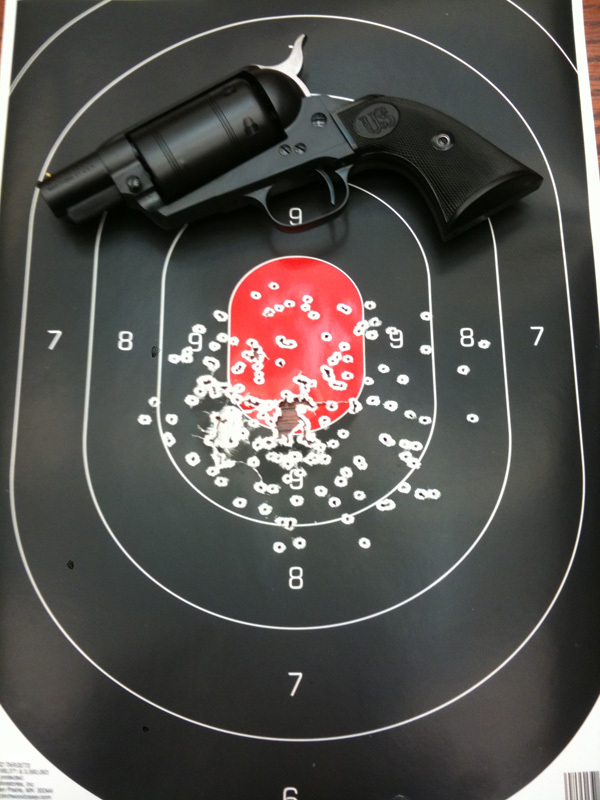 I have an Answer unit on my lightweight S&W Commander-length gun, which is in effect my working 1911. On some 1911s I don't have a problem at all...the Para LTC 9mm comes to mind, or a little Kimber Wayne Novak tuned. IO always thought one of the huge benefits of the Detonics Combat Master was the absence of a grip safety. And speaking of 1911, at DRTV we'll have some very interesting news for you in a couple of weeks as part of our continuing coverage of the year of the 1911. BTW, interesting that Freedom Group has canceled their plans for an IPO. Right now we're in a handgun market...defensive handguns are selling great guns, so to speak, but companies with the bulk of their product lines in rifles and shotguns are finding the current market challenging. We'll have a full report on DRTV tomorrow! We will have video at DRTV Wednesday AM. April means spring down below, but up here at the Secret Hidden Bunker, it's the most brutal month of winter. The wind is relentless...last night we had gusts of 70 mph and one of our big pines went down. Luckily, it wasn't near the Bunker! I need to fish out the pickaxe and start slamming away on the Driveway Drift, which will last into June (last frost date is mid-June). The USFA Forum has pixs of this really funky single-action .45/.410...of course it's April 1, but you never know. Of course it's April 1, so you never really know, but I say, what the heck? I like the poster who suggested the new gun be called The Judge Roy Bean...nudge nudge wink wink say no more! On another shot pistols issue, at SHOT I reported that sources told me — apparently erroneously — that the Taurus Raging Judge 28-gauge DA revolver and the Taurus Rossi Trail Judge .410 mares leg-style lever action pistol had run afoul of the BATFE, taking a few days off from their primary job of smuggling guns into Mexico, and would not come to market. Well, despite all the buzz immediately after SHOT, there still seems to be some question as to whether those guns will see the light of day. My friend Richard over at Guns, Holsters & Gear has been keeping up with the mixed signals on the Raging Judge (which, hell, I will buy on the spot if it ever makes it to the market!). At least one blogger (Gun Nation Podcast) says the 28-gauge behemoth is dead, but Taurus Big Guy Bob Morrison (who regularly reads this blog, so please chime in, Bob!) talking to Tom Gresham says Taurus is still working with the tech guys at BATFE to get the gun to market and it will eventually arrive. The Rossi Trail Judge .410 (another gun I'd buy on the spot, BTW) apparently is not going to be produced. Last week Marshal Halloway at DRTV talked to a highly placed Rossi rep who said the gun would not be produced because there wasn't sufficient interest in the gun at SHOT. Other Internet sources have gotten similar responses from Rossi Customer Service. 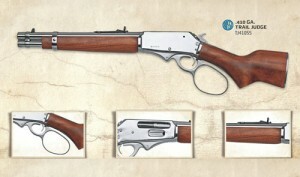 Of course Rossi already makes a line of superb Winchester 1892 clones...one of my all-time favorite lever guns is a Rossi 24-inch octagonal-barreled stainless .38/.357 '92, to which I've added a Marble's Tang Peep Sight. It is crazy accurate with whatever .357 loads you can stuff into it. Let me throw an additional big caveat here...gun companies will find a way to make what the public demands, and Taurus is a master at filling market niches. Both of these guns may eventually make it to market...or they may not. Speaking of mare's legs, I see that Henry Repeating Arms is also producing 2 versions — a brass-framed, octagonal barreled .45 Colt and a sweeeeeeet 10-shot .22LR blued version. 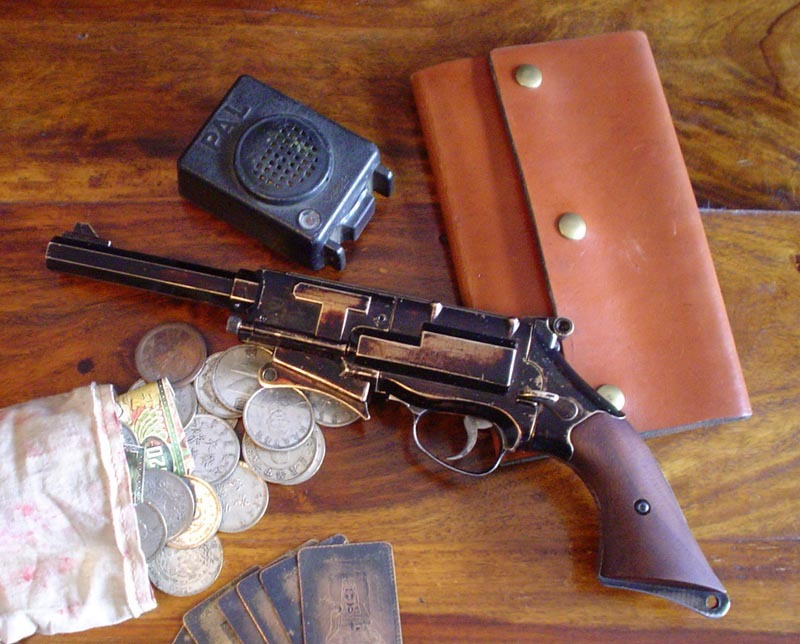 The .45 Colt is a pricey $950, but the .22 is clocking in at $360 MSRP. Go ahead, you know you want one! Henry is an interesting company...innovative, willing to try different things and really committed to the youth market (with guns young people can afford, too). I have a couple of their rifles, including a .22 Golden Boy that has been a training workhorse.